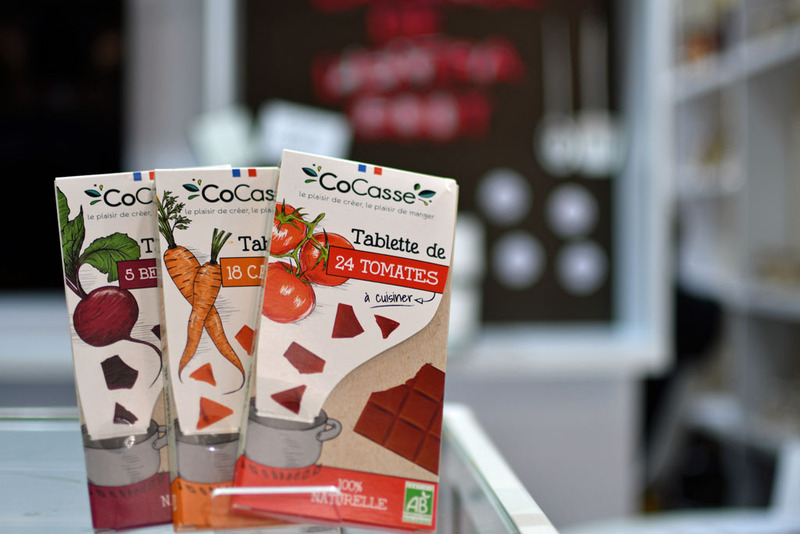 It was during our active monitoring of the marketing campaign at SIAL 2018 that we discovered CoCasse, one of the candidates for the SIAL Innovation Awards, which presented a product never before seen: a vegetable concentrate in the form of a tablet. The resemblance to a chocolate bar was so striking that visitors fell for it, some thinking that the squares of vegetable concentrate could be eaten. Back in today’s article on a culinary and aesthetic sensation, combining marketing innovation and entrepreneurial passion, with Kevin Singer, one of the founders of CoCasse. It is also an opportunity for us to discover the power of networks, the interest of incubators in launching the entrepreneurial project and the genesis of a product that was initially a student project. 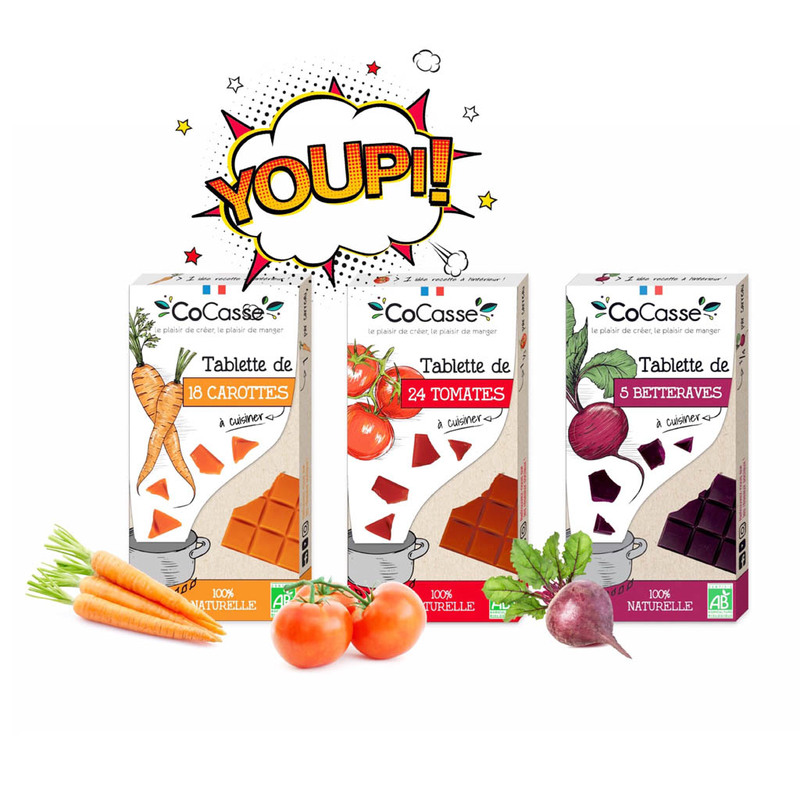 CoCasse, an agri-food start-up created in August 2017, is the result of a student project aimed at developing an eco-innovative food innovation in the form of a vegetable tablet. This tablet is a natural cooking aid, 100% organic, containing only 2 ingredients: vegetable at 65% (for taste, nutrients and colour) and cocoa butter at 35% which serves as a binder and gives the specific structure of the tablet (crisp and melting). It was in March 2017 that Kevin Singer and Pauline Berthonneau, the two founders, decided to launch their company. And it is at SIAL 2018, the international agri-food exhibition that takes place every two years in Paris, that the official presentation of the finalised product takes place. If the marketing success of a product often comes from its differentiating character, the CoCasse tablet is indeed not to be outdone. Its recipe is distinctly different from that of other stock cubes. The latter contains only a small amount of vegetables (sometimes only 7%) but a lot of salt, additives and flavour enhancers. The decision to go against the existing trend and work to change the shape of the final product makes it essential to use a binder. Cocoa butter has become popular because it can be melted and solidified again. It was also chosen because it is a noble fat with unsaturated fatty acids necessary for human nutrition. In the interview with Kevin Singer, he described his product as a breakthrough innovation compared to traditional stock (cubes), a change that, as often happens, required educational and consumer support during the preparatory phase of the project (from March 2017 to June 2018). The tablet format of the product is indeed double-edged. If it is readily understood that the tiles can be broken, the mental anchoring of the chocolate bar image can lead to confusion and make you imagine that the vegetable tablets can be tasted as they are. The packaging has therefore been designed to avoid this confusion, both in terms of the text and the visual aspect. Today it is notably through the packaging and the advice provided for the use of the tablet that this primary education takes place. Breakthrough innovations can sometimes cause adoption problems. When conducting market research, make sure to pay particular attention to these aspects. Consumers often have consumption habits that are difficult to change. Being too ahead of your time, also against the current, can lead to failure despite all the intrinsic qualities of the product or service. To study adoption, track the customer experience and research whether your product or service fits in without difficulty. The product is the result of a student project carried out from the end of 2015 to June 2016 by 9 people. Only Kevin Singer and his partner having more entrepreneurial spirit decided to embark on this adventure on their own. During the student project, prototypes were made that received positive feedback from the general public as well as from significant food players. The product, therefore, had a potential that needed only to be confirmed, refined and then exploited. It is during a 6-month internship followed by a fixed-term contract that the project matured and that the two creators prepared for its launch. The market research was carried out in a food sector in search of innovations (this trend can be found, for example, in the oils and vinegar sector, whose inventiveness was evident at SIAL 2018; see our article on co-branding and sensational ingredients on this subject). The stagnant culinary aid market was waiting for an innovation such as this to be revitalised. Meetings with professionals were therefore made possible by this search for change on the one hand, and thanks to 2 business incubators, on the other hand, that of IMP Atlantique and Atlanpole. By acting as intermediaries, they mobilised a network of professional contacts and met distributors to collect insights on the market. The qualitative phase of your market research could involve interviewing experts in your sector. Access to these people is often complicated, so remember to use your network to identify the people who can intercede on your behalf and open the right doors for you. The CoCasse example also shows that incubators are an ideal place to start a project. This ecosystem is indeed vibrant and can be used to develop your project. The possibility of presenting prototypes, a method rarely used in traditional market research (see step 2 of our market research guide for more information), has made it possible to collect feedback to make adjustments on the final product. The distributors commented on the packaging, which was manipulated or even opened on the shelves and deserved to be redesigned. The final version will, therefore, have been produced with a tamper-evident label. The caterers submitted comments on the format, which is ideal for the consumer but needs to be adapted for professional use. Think about prototyping to gather insights about your products. Talking about a future product is easy, but customers’ cognitive projection ability is limited. Having a prototype will make it possible to offer, in addition to a concrete basis for discussion, a useful support for the exchange. You will find our advice on prototyping in Phase 2 of our practical guide to market research. As is often the case, the funding of a start-up is intended to be progressive and follows the development stages of the entrepreneurial project. The first expenses, before the creation of the company, were thus financed thanks to the fixed-term contract, which allowed a personal contribution. Also, there were state and EU subsidies that were used by the creators. In a second step, a participative fundraising campaign in partnership with Crédit Mutuel concerned circle 1, that is to say, the relatives, then circle 2, the friends of the relatives, and circle 3 which is even more distant. The use of traditional bank credit only occurred when the machines were purchased. The bank was appreciative of the product itself and its potential, well-argued thanks to the prototype, the studies carried out and the success in the various competitions. It will also have been reassured by the well-established business plan validated by a well-known accounting firm, as well as by other financings to repay the loan, thus minimising the risk for the company. Finally, a venture capital fund, which was raised through participation in an investors’ exhibition. Only go to the banks after you have proven yourself. In addition to sound market research, banks will be reassured by the first sales, which will be a tangible expression of market interest. In addition to the pleasure of being present and being able to introduce the product to professionals and the general public, SIAL 2018 has generated feedback that has led to improved communication around the product. The winning of the Innovation Espoir prize is also an incentive for the two entrepreneurs. The feedback received is very much related to development, in particular, the possibility of using other vegetables (or even fruit for sweet recipes), as well as variations for snacking (which should, therefore, be softer in terms of taste). SIAL has also made it possible to gather a lot of contacts from distributors and suppliers. The lead catalogue has been expanded accordingly. CoCasse tablets have been on sale on Amazon since November 2018. The test was very positive: between 600 and 700 tablets sold in just one month. Selling via a third-party platform allows you to test market demand without having to invest in an e-commerce site. So, remember to reference your products at the time of launch. Fundraising planned for late 2019 to increase the number of production lines and change premises. The product is expected to be made up of 6 tablets, fruits and vegetables combined.